If cryptography were a car, then the hashing algorithm would be its engine. If cryptography was a body, its hashing algorithm would be the heart of it. If cryptography was a car, its hashing algorithm would be its engine. If cryptography was a movie, its hashing algorithm would be the star. If cryptography was the solar system, its hashing algorithm would be the sun. Okay, that’s probably too far, but you’ve got the point, right? Before we get to the what hashing algorithm is, why it’s there, and how it works, it’s important to understand where its nuts and bolts are. Let’s start with hashing. Let’s try to imagine a hypothetical situation here. Suppose you want to send a message/file to someone and it is absolutely imperative that it reaches its intended recipient in the exact same format. How would you do it? One option is to send it multiple times and verify that it wasn’t tampered with. But what if the message is too long? What if the file measures in gigabytes? It would be utterly absurd, impractical, and, quite frankly, boring to verify every single letter, right? Well, that’s where hashing comes into play. Using a chosen hash algorithm, data is compressed to a fixed size. Let’s understand this with an example. If we take the sentence, “Donkeys live a long time” and apply the joaat hash algorithm to it, we will get 6e04f289. This value is known as a hash. Hashes are highly convenient when you want to identify or compare files or databases. Rather than comparing the data in its original form, it’s much easier for computers to compare the hash values. Whether it’s storing passwords, in computer graphics, or in SSL certificates, hashing does it all. Fundamentally, hashing is defined by two distinct characteristics – irreversibility and uniqueness. Irreversibility points to the fact that once you hash something, there is no way back. Unlike encryption and encoding, you can’t easily de-hash a message/data. Unique, because no two hash values are ever the same for two different pieces of data. If two hashes are found to be the same for two different pieces of data, it’s called a ‘hash collision’ and that algorithm becomes useless. “Behind every successful hash algorithm, there is a great hash function.” – We just made that up. Let’s put the jokes aside for a moment and concentrate on the crux of the matter. A hash function is a mathematical function that converts an input value into a compressed numerical value – a hash or hash value. Basically, it’s a processing unit that takes in data of arbitrary length and gives you the output of a fixed length – the hash value. The length of the output or the hash depends on the hashing algorithm. Generally speaking, the most popular hashing algorithms or functions have a hash length ranging from 160 to 512 bits. Now, let’s move on to the part you’ve been waiting for. 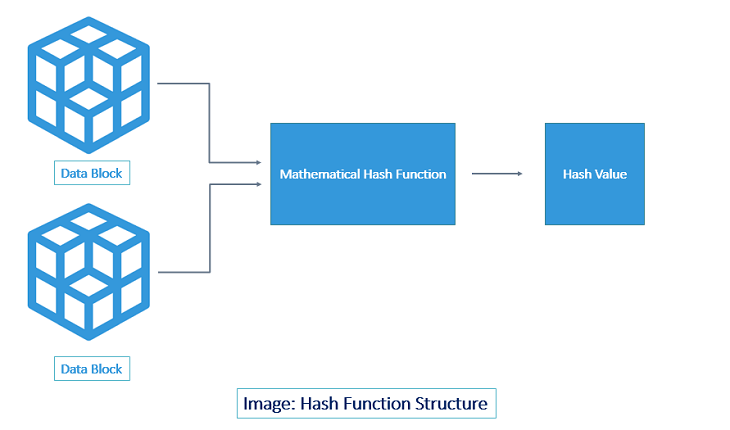 What Is a Hashing Algorithm? How Does it Work? As we discussed, a hash function lies at the heart of a hashing algorithm. But, to get the hash value of a pre-set length, you first need to divide the input data into fixed sized blocks. This is because a hash function takes in data at a fixed-length. These blocks are called ‘data blocks.’ This is demonstrated in the image below. Published at DZone with permission of Jake Adley . See the original article here.